To matches in one day? No problem for world number one Simona Halep, who advanced to the semifinals in Cincinnati with her second straight-sets win of the day with an epic comeback against Lesia Tsurenko. For a moment, it looked as though playing two matches in a day would prove too much for world number one Simona Halep, as she started slowly in her quarterfinal against Lesia Tsurenko just hours after her third-round match with Ashleigh Barty. However, the top seed found her rhythm, winning 11 of the last 12 games to book her spot in the Western and Southern Open semifinals. Halep has been a slow starter all week and started the quarterfinal match falling behind 4-1. From there, the top seed seized control of the match and pummeled Tsurenko into submission. In the end, she only needed an hour and seventeen minutes to claim a 6-4, 6-1 victory. Getting into an early rhythm has been a problem for Halep, who trailed by a break in four of the first five sets she has played this week in Cincinnati. She had a chance get off on the right foot of her quarterfinal, holding a break point in the opening game of the match. But she failed to convert and then the old patterns crept in. The top seed fell behind 15-40 in her opening service game and only managed to save one as she fell down another early break. Halep responded quickly, breaking in the very next game. 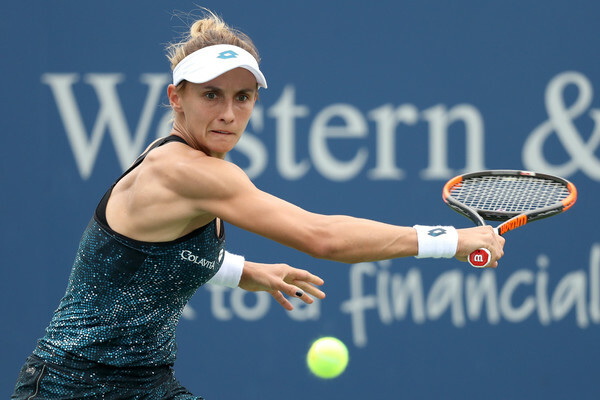 But despite having to game point to level at 40-15, the world number one would slip up again, losing four straight points to give Tsurenko the break lead back. The Ukrainian would hold to stretch the lead to 4-1. The turning point in the match came in the next game when Halep went down love-40. A break and Tsurenko would be serving for the set. Instead, the world number one upped her level, saving all three break points, plus another at 40-AD, to hold. That swung the momentum in her favour, as she broke in the next game and held to level the set at 4-all. The top seed kept rolling, converting her lone break point in the following game to take her first lead of the match. Tsurenko tried to hang on, but Halep went up 40-30 and only needed one set point to wrap up the opening set. Halep finally seemed to turn the corner in the second set, getting off to the quick start rather than falling behind, breaking to start the second set. She had to fight through a deuce to consolidate but managed to hang on for a 2-0 lead. Now seemingly filled with confidence, Halep added a second break to go up 3-0. Tsurenko had a chance to stop the bleeding and claw back in the following game when Halep sent a backhand wide to go down 15-40. But the world number one was up to the task, saving both, the first with a big serve, and holding to stretch her lead to 4-0. At 30-all in the next game, Tsurenko double faulted to give Halep anther break point, which she converted with a tightly-angled crosscourt forehand. Serving for the match at 5-0, the world number one had won ten straight games. Her run was finally stopped when a series of errors dug Halep into a love-40 hole. Tsurenko would fire a deep return that drew an error to reclaim one of the breaks and avoid the bagel. Still, it did little to slow the world number one, who ripped a forehand down the line in the next game to go ahead 15-40, double match point. Halep fired a deep backhand down the line to draw an error and book her place in the final four. Neither woman was particularly impressive on serve, each winning less than 50 percent of their first serve points (Halep 44, Tsurenko 47). However, Halep was strong on her second serve, winning 75 percent. Tsurenko only managed 32 percent, double-faulted seven times, and only saved one of the eight break points she faced. Halep will meet Aryna Sabalenka in the semifinals.